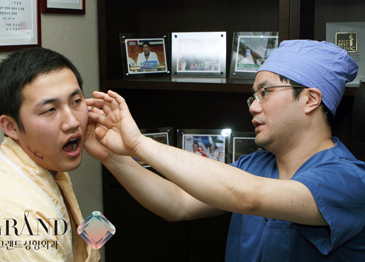 Dr. Ryu Sang-Wook (right), the medical director of Grand Plastic Surgery Clinic treats a patient in his clinic. Located in Seoul’s Gangnam area, the Mecca of South Korea’s medical tourism industry, Grand is one of the most popular plastic surgery clinics for medical tourists visiting South Korea. South Korea, perceived all over the world as a high tech country, has every chance to be internationally known not only for its electronic devices and industrial goods but also as a destination for medical tourism. The expansion of Korean medical tourism is considered to be since 2007, when Korea actively began to obtain its first medical tourists. 1) From that time medical tourism, as one of the sectors of national industry, began to grow speedily and attract medical tourists all over the world. 7,900 tourists visited Korea for medical purposes in 2007 and this number hopped to 110,000 by 2011. 2) And it can be said with certainty that Korea can be viewed as a strong competitor in the eyes of already established countries like Singapore and Thailand in the sphere of medical tourism. And one of the main reasons for such a rapid increase of patients is more attributed to the quality of medical service than to the cost incurred. One of the main appeals that attract tourists to Korea appears to be highly advanced medical equipment and professionalism of medical specialists. According to a market-research survey of international patients visiting Korea for medical tourism, 48 percent cited the quality of medical service and technology 3) as their main reason for preferring South Korea. And this high percentage just highlights and proves that quality takes priority of price. From the other hand it may be argued that price is a governing factor. Affordable price is what most patients usually consider while choosing among medical providers. But according to the opinion of patients in determination of choice quality tips the scale, especially when matter touches plastic surgery. Chinese which constants the largest portion of Korean plastic surgery market (more than half of the visitors in 2010 came from China) 4) appears to be quite satisfied with consequences and prices. 5) Another patient from New Zealand said that while considering alternatives where to undergo eyes and nose surgery, decided on Korea and one of the determining factors was that Korea appeared to be safer to undertake surgery and prices were not so high. 6) Plastic surgery is not the only attraction for many of those patients from Russia and Central Asian countries who come for medical treatments for sterility, oncological and cardiovascular deceases. A friend of mine, who is a native Russian speaker and who works as a medical coordinator at one of the hospitals that deals with medical tourism, emphasizes that there is a large demand for coordinators with language ability in Russian, which points out that there is a large steam of patients from these countries. Developed technologies and capable doctors is what patients seek here in Korea and even prices are comparatively high relative to these countries, a steam of patients shows no signs of slowing down. Being quite a young player (2007) in the medical tourism market Korea is expanding rapidly and attracts more patients around the world. And while cost is one of the determining factors when considering a place for a medical destination, quality of advanced technologies and professional doctors seem to be indicating factors that drive most patients. Quality as a main asset and available prices should lead Korea to become one of the leading providers of medical tourism in the near future. Ms. Antonina Park seves as a contributing writer for The Seoul Times. Park, who is from Turkmenistan, studies at the University of Foreign Studies in Seoul. Her major is business administration. Fluent speaker of Russian, English and Korean, Park is interested in the medical tourism.